In the Discovery Zone, Pre-K4 – 1st grade students can explore, wonder, imagine, and create using their senses. This unique space encourages students to uncover fascinating and fun science, math, music, and art information. Technological enrichment is achieved through coding and constructing simple machines. There is no limit to where their curiosity will lead them. The team instrumental in bringing the concept to fruition includes: Mrs. Alexa Cox, Principal; Mrs. Loretta Federline, Resource Teacher; Mrs. Karin Abbott, Arts Integration Specialist; Mrs. Kathleen Oleszczuk, STEM Specialist; Mr. Joseph Oleszczuk, Director of Educational Technology in the Archdiocese of Baltimore; and the Archdiocese of Baltimore Department of Catholic Schools. Delegate Mark Chang and Chancellor of Education Mr. James Sellinger were also in attendance. After Delegate Chang and Mrs. Cox cut the ribbon, Fr. Brian Rafferty blessed the room and all those who will use it. 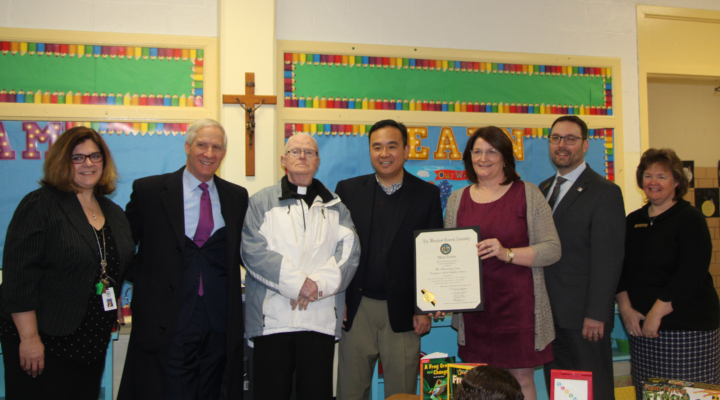 Delegate Chang recognized Slade as a leader in private education in northern Anne Arundel County and an asset to the area’s educational community. He commended the prudence of Slade’s development of an environment where even the youngest students can begin to develop the skills essential for productivity and success in their generation’s workforce. He presented Cox with an official citation from the Maryland General Assembly recognizing the grand opening and dedication of The Discovery Zone.